Home » Today » What will future homes look like? Future homes will use alternative energy sources. Dear EarthTalk: Given all the advances in residential household efficiency, can you paint a picture of what the home of the future will look like? No doubt, homes in the future, whether single-family dwellings or apartments in larger buildings, will be much greener than what we are living in these days. For starters, the use of sustainable, locally sourced (and ideally recycled) materials will be the norm, not the exception, to avoid the unnecessary emissions and resource consumption required to make new stuff and ship it around the world. Homes of the future will be energy efficient. Part of this efficiency will come from better insulation, doors and windows that keep the heat/cold inside where you want it. The other part will come in the form of renewable energy generated on-site, whether from rooftop photovoltaic solar panels, thin-film window treatments, solar shingles, micro wind turbines, kinetic energy harvesters or other newfangled technologies. And all this self-sustaining energy will be stored in your own high-capacity batteries probably not so different from Tesla’s Powerwall array. While the picture painted above may seem far-fetched, it’s really not, given that you could build a home that met all of the above criteria today for not much more than a conventional home. That said, it might be greener still to retrofit your old-school home with eco-friendly upgrades than to tear it down and build a new one, given the emissions associated with manufacturing, materials transport and assembly on a new structure. While the new home will be more efficient, it could take decades to “pay back” the “carbon debt” accrued by building from scratch. Of course, all buildings run their course eventually, so when it is time to tear down, it’s good to know there are plenty of green options to replace the old homestead. 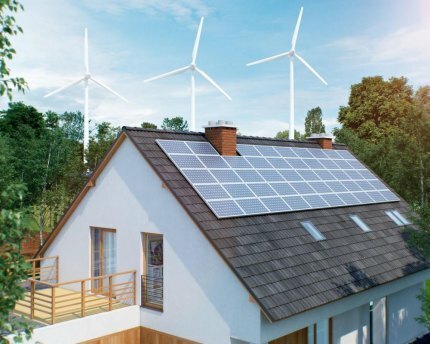 And with California adopting new building codes that go into effect in 2020 calling for all new construction of single-family homes and low-rise apartments to meet zero net energy standards (whereby they generate as much power from on-site renewables as they consume from the grid), the future may be here sooner than we imagined.